Let me clear up a few things before I go on. I had been eyeing out Hard Graft products for months. These are great looking products and the materials are premium, hence their price. What was I looking for? 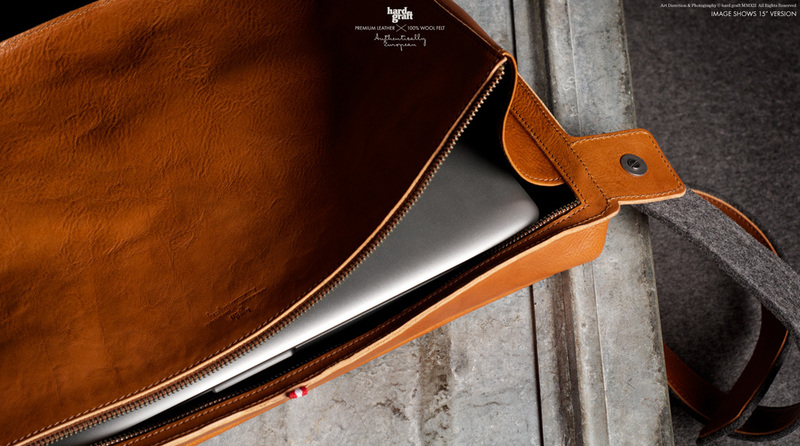 A nice looking, slim bag that would carry my laptop. One that would last me for many years to come. This isn’t a review on Hard Graft or their other products. I had my Flat Pack for less than a week. Hard Graft’s return policy meant I had to make my decision briskly. The 15″ Flat Pack is all about form, not function. 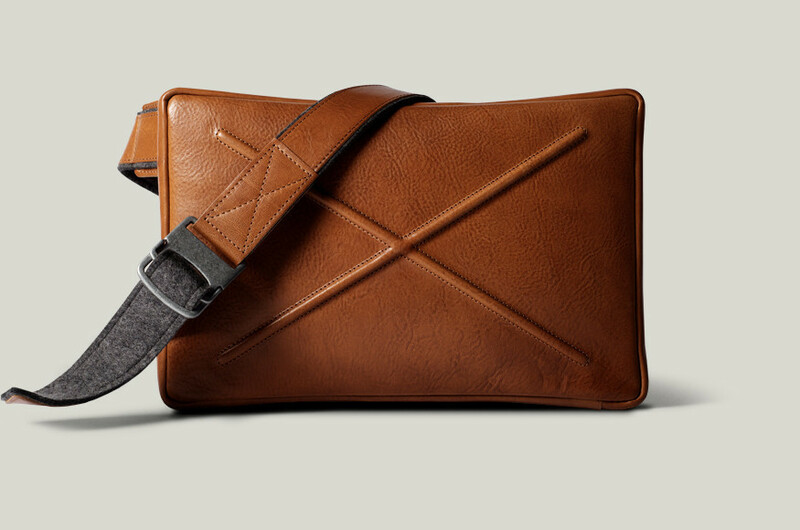 The shoulder strap is attached to the bag at a ninety degree angle. There is no hinge, so the strap can’t move around depending on where your holding your bag (the bag does have a hinge, please see update below). The bag seems to be designed to carry along your back, not to your side. This may be suitable for the 13″, but I found the 15″ too big to sit along my back comfortably. With the ends of the bag sticking out too far for my liking. This is the 13″ being carried. The bag looks great. But looking great doesn’t always mean it’s going to be comfortable. There’s a lip along the edge of the bag. This lip sticks into you when you’re carrying the bag. This is probably the most minor point I’ll make, as the leather would wear in eventually and you would feel this less. The bag is very simple on the inside. There is no padding. No separator, just one big space. There are two smallish open pockets along one interior wall of the bag. Not the most useful of pockets as things can easily fall out if the bag is tipped to the side. No separator also means you have to worry about your laptop getting scratched if you start to put other items in along with it. Those sunglasses aren’t going to be lasting too long in there. This is all fair enough. The bag isn’t designed to carry a lot. Only the essentials. This is what I was looking for in a bag. Or at least what I thought it was. I don’t like carrying my charger with me when I can avoid it, but that doesn’t mean I don’t consider it to be essential. You cannot comfortably or safely fit a charger in the Flat Pack along with your laptop. The only safe place I could put the charger was in one of the open pockets, so as not to scratch the laptop. This would cause a huge bulge out of the back of the bag. Meaning it would stick into your back when trying to carry it. I couldn’t help but feel this would also put pressure on the expensive Retina screen, as it was quite a tight fit. If I’m going to spend this much money on a laptop bag, I need to be able to carry my charger. I don’t like the look of that zipper on the back of the iPad. The biggest issue I had with the Flat Pack is the zipper. It’s a big steel zipper that looks nice and works well. The problem is that you have to be extra careful not to scratch your laptop every time you put it in and take it out. You have to ensure the zipper is open the whole way before taking the laptop out and still be careful not to scratch it along the open zipper. This is not acceptable in a laptop bag. Especially not one that costs this much. This was the nail in the coffin for me. A great looking bag that just isn’t functional. There’s nothing separating your laptop from the zipper. When I was first looking to purchase the Hard Graft Flat Pack 15″, I looked over these images countless times. Yes, all the images used in this post are from the Hard Graft site. It was all right there, yet I didn’t see what I see now, not until I was able to try the bag out in person. I wanted to love this bag. I guess that’s normal when you buy an expensive, premium product. You sometimes convince yourself it was worth it. In the case of the 15″ Flat Pack, I’m glad I didn’t. Ben Brooks has featured this article as an alternate view to the Hard Graft Flat pack, of which I am grateful. This was the very intention I had when writing this article. To give people an alternate point of view on what is a subjective matter. Ben mentions I had made a mistake in my article in regards to the hinge of the bag. I must have missed that the strap does turn away from the hinge. It must be quite tight at first, as I had tried several times to move the bag into different positions and move the hinge around. This is no doubt something that will loosen over time. In my opinion, I still don’t think the bag is designed to be held to your side. Even if the hinge turns, the part connected to the bag is at 90 degrees and will still pull at the bottom. However, I can’t speak of this in certainties as I no longer have the bag. 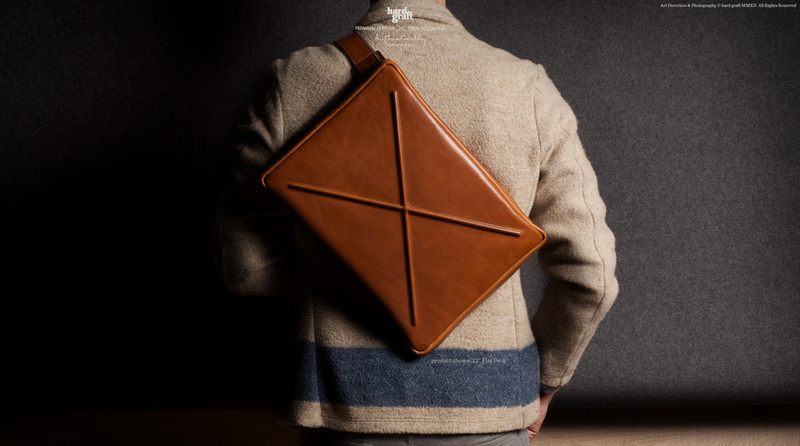 I think I’ve found my ideal laptop bag: The Knomo Kobe Messenger Bag. I’ve come *so close* to ordering this bag – and various other bits of Hard Graft gear – over recent months. I’ve poured over the pictures… It certainly looks beautiful, and I don’t object to paying for premium materials and construction, but I have been concerned that it didn’t look like it would do a good job of actually carrying stuff and staying looking good. I would have liked to handle the products too before ordering – in a store or at their London location (I’m London-based) but it seems that’s not possible. My last expensive bag became a shapeless mess (even with a lot of care to maintain and not overload it) very quickly as the materials sagged and it wore badly. That’s a mistake I’m keen not to make again. What kind if bag wore too quickly? I’d like to make sure I use caution if I find myself considering that product. 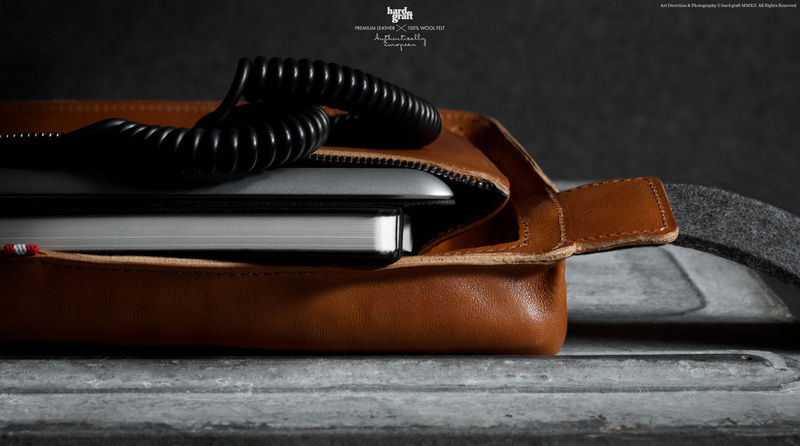 It was an Italian brand – Mandarina Duck. I hadn’t heard of this bag until I saw Ben Brooks’ link to this, but I’m certainly not in the market for it. It may be premium materials, but I don’t like the look and when it’s form over function, if the form doesn’t appeal, they’ve got nothing. The detail errors that you point out here look fundamental to me. I can see why you returned it. The messenger bag market is a crowded space – I think they’d have to get the basics right to stand a chance. I have the 13″. It definitely doesn’t have a hinge. Maybe the hinge is unique to the 15″. Both straps on mine are sewn into position at a 90 degree angle to the bag. The bag is gorgeous, but the way the straps are attached means the bag sits at an awkward angle if its worn in any other position aside from flat to your back like in the picture. 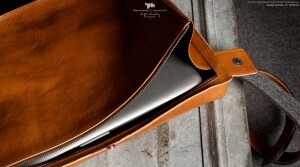 Has anyone found the ideal laptop bag (apart from the Knomo Kobe mentioned above which I don’t really like the look of? Having the original 11″ air version I agree with all of the points made. 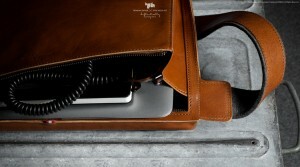 Looks great but it’s an impractical bag for daily use. I was kind of disappointed that there’s no dividing pocket nor is their adequate padding. But I’m not convinced nor do any of the photos demonstrate padding or the implied layering, which is just vague wording. Not particularly well thought out from a design standpoint either. The zipper is my maine gripe, it quickly becomes a tedious process to carefully manoeuvre a laptop into the bag. really appreciate the review. these are the user points that I needed to hear. thanks! Thanks for this extremely useful review. I had added this bag to the cart and was in the process of placing my order (I am based in the US). This was going to be for my husband and I can tell you he would not have been able to overlook the naggings you mentioned. I was also interested in their woollen bag, but considering that we have two big hairy dogs, I quickly deserted the idea 🙂 A Teflon kinda material option for this would have been terrific – of course with modifications to design as you suggested. – ideally cruelty free, but given the limited options at least for this one item in our home, we can be accomodating. I guess stylish, thoughtfully designed stuff for men remains as elusive and challenging as ever. I usually do not comment online, but I just had to to tell you how thankful I am for saving me a pretty chunk of change! I purchased a Hard Graft Flat Pack Heritage ($375 USD) after ordering a new 13″ MacBook Pro late in October of 2012. A month ago I noticed that the leather was cracked . . . through the material in one of the corners. Pls note all I carry in the bag is the laptop with no power cord since I use it to clear TSA w/o the need to remove the computer. I wrote Hard Graft detailing the problem that was accompanied by a photo and a request for them to kindly support their product. Below are excerpts from their reply. I will poke my eye out with a stick before I do business again with a company that attempts to shift blame to their customers, and lacks the integrity to stand behind their product. I am in the same boat as many of you here. I’ve had a notion to purchase the iPhone/card cases several times, but after getting over the elegant photographs, I come back to 3 cracked screens I’ve suffered in the past. Their items are not designed to protect a phone from damage; if you drop these various card/case combinations, the phone will go sailing and it’s sudden shatter or scuff death. Not the service you expect from a company selling $400 messenger bags. I spent months looking for the perfect iPone case for my iPone 6. 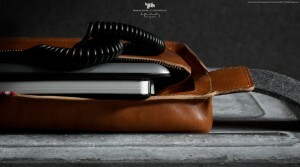 I wanted quality leather and felt and the Mighty Phone Fold Wallet looked perfect, at least from the pictures on Hard Graft’s website. They strongly emphasis the quality and will “never send out used goods to you”. It makes you wonder why they bang on about this in the first place as if they do indeed do that. Well, I have fallen victim to this today. I received the wallet by DHL this morning and could not wait to open it. A HUGE disappointment, I felt sick looking at a case with several scratch marks on the front, market black leather on the inside with with a small torn patch with leather missing, dents/scratch to the area where the cards are kept and severe folder wear to where a charging cable is used. I emailed them straight away as they do not give you a telephone number stating my disappointment and that I want a full refund. I have not heard back yet. I will not purchase anything from them again as I do not trust them. No quality, no luxury – it’s a joke on me!